Home World Affairs North Korea Convenes Top-Level Meeting Over “Tense Situation”: Report. North Korea Convenes Top-Level Meeting Over “Tense Situation”: Report. 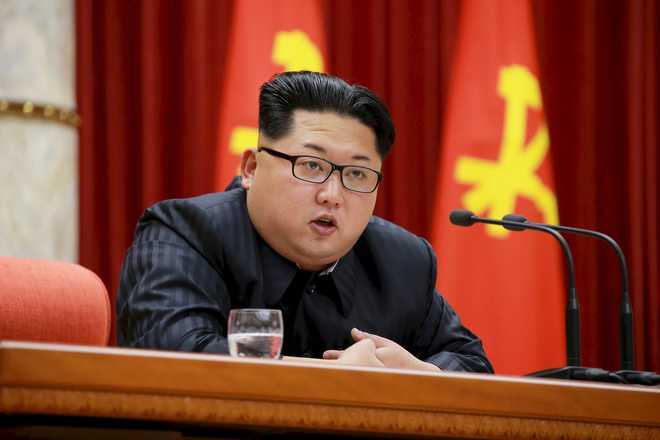 North Korean leader Kim Jong Un called a full meeting Wednesday of a top committee of the ruling Workers’ Party to address what he described as the “prevailing tense situation”, state media reported. In a meeting with senior officials Tuesday, Kim ordered them to display “an attitude befitting the masters of the revolution and construction under the prevailing tense situation and thus follow through on the new strategic line of the Party”, KCNA reported. Last April Kim declared that the ruling party’s “new strategic line” would be “socialist economic construction” and its quest for nuclear development was complete.Kim made “a deep analysis of the matters pending urgent solution in the party and state”, KCNA said, adding that at Wednesday’s meeting the central committee will “decide the new orientation and ways of struggle in line with the need of the prevailing revolutionary situation”. It comes ahead of the opening of the country’s rubber stamp legislature on Thursday.Cheong Seong-chang, an analyst at the Sejong Institute, said it would be difficult for Kim to lay out a new policy direction while Trump continues to express a willingness to maintain dialogue. Instead Wednesday’s meeting could involve a reshuffle of party officials including Kim Yong Chol, the North’s top envoy for talks with the US, who has been “blamed the most for the failure of the Hanoi summit”, he said.It would signal a green light if he is replaced with a more flexible and practical figure, but if he stays, denuclearisation talks won’t be easy,” Cheong said. But the failure by the pair to reach agreement at their second summit in Hanoi — which broke up without even a joint statement — has raised questions over the future of the wider process. Previous articleOmar seeks response from PM Modi over Imran Khan’s ‘endorsement’ for next term.